Plymouth Rock Scene: oEstro Jam Charity Gig , Varsity Plymouth Embers of Eden Headlining. oEstro Jam Charity Gig , Varsity Plymouth Embers of Eden Headlining. Varsity will be hosting a charity gig on the 13th April 2014 in aid of Breast Cancer Awareness. 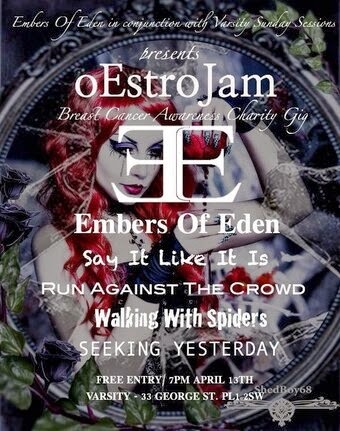 Embers of Eden will be headlining the gig with support from Say It Like It Is, Run Against The Crowd, Walking With Spiders and Seeking Yesterday. All of which are female fronted rock bands so if you are a fan of Lacuna Coil, The Dirty Youth, Paramore, Tonight Alive and Halestorm you will be well catered for. Even if you have never heard of any of the bands listed come down as it will be a great night.